Critics have accused British ministers of scaring MPs into backing her deal with talk of hoarding essential supplies, but Mrs May yesterday said precautions were “responsible and sensible”. However, Tánaiste Simon Coveney accused her of “bravado”, insisting Britain “cannot afford” to crash out of the EU. Mr Coveney said walking away from negotiations with Brussels would have “significant” and “negative implications” for Britain. Mrs May, a Remain voter who has repeatedly refused to say she would vote Leave if an EU referendum were held today, was asked if she was a “committed Brexiteer”. Mr Coveney, in London for talks aimed at restoring power-sharing in Northern Ireland, said that rather than talking about stockpiling, “we need to be focusing on the intensification of negotiations to try and find solutions and a way forward, as opposed to this tough stance that some people feel the need to take”. He was speaking as negotiations resumed in Brussels yesterday in a continued bid to find a solution to the Irish Border question, following a week where the EU side questioned the practicality of Mrs May’s Chequers deal. 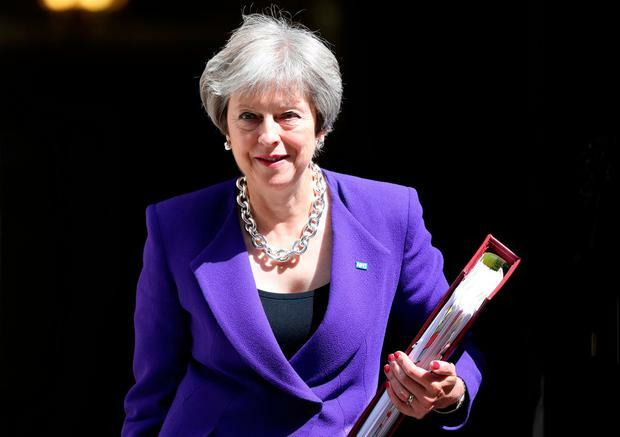 Talks remained deadlocked over the nature of the Irish backstop, which Mrs May rejected as “unacceptable” because it would create a border in the Irish Sea, dividing the United Kingdom. It is understood negotiators on both sides are considering innovative solutions that could include creating a “parallel backstop” for the UK mainland to sit alongside the EU’s backstop for Northern Ireland. Both sides warned the idea was fraught with political difficulties, but it might open the door to a withdrawal agreement by the end of this year.